iOS 7 looked modern; iOS 8 actually is modern. That’s it in a nutshell. When phones were comparatively underpowered, it made sense to limit and confine them. It kept them running smoothly. But Android proves that isn’t necessary anymore and iOS 8 embraces that reality. Some of its additions, such as HealthKit, HomeKit and Apple Pay, remain an unknown quantity. They have the potential to enrich the Apple ecosystem, but it’s too early to say that they will. Others, such as Handoff and Continuity, prove we’re reaching the point where considering Mac OS and iOS as separate is archaic. Vitally, though, it’s not just other Macs that iOS 8 plays nicely with, it adds some much needed third-party integration, too. Let’s start there. Of all the changes in iOS 8, its support for third-party apps and extensions is the most obvious. You’ll notice it mainly because your apps will start asking for and telling you about things they didn’t before. This is the moment Android fans scoff in derision, but this kind of interaction is a largely new thing for iOS. The biggest change is support for third-party keyboards. We’ve already covered the most prominent in our best iOS 8 keyboards feature and SwiftKey review, but it’s a fundamental change in how iOS 8 operates and it’s a very good thing. The standard keyboard is good, albeit with one or two quirks we’ll get to later, but you’ll want to try the alternatives. There is already a small smattering of very good keyboards in the App Store. This opens up some security and privacy concerns, of course, but iOS 8 reverts to the standard keyboard when entering passwords. You can have multiple keyboards installed and switch quickly between them, too, which is helpful. It’s a great addition, then, but bugs persist at present. Nine times out of ten third-party keyboards work fine, but animation glitches such as keyboards ‘popping’ into view or not rendering correctly are regular enough to be off-putting. The keyboards are great, but we found the ability for apps to interact with each other more vital. On a basic level this makes it easier to share content from the likes of Safari. Avid ‘Read it Later’ fans can now save articles to Pocket, Instapaper and co. without resorting to fiddly bookmarklets, for example. Even more useful are action orientated extensions, such as those supported by Last Pass and 1Password. These extensions mean you can input usernames and passwords straight from Safari, shortcutting the whole process dramatically. This is the best example of such extensions, but we hope to see more soon. Widgets in iOS 8 are limited to the Today view, a decision that works very well. Apps are only just starting to add this functionality, but what makes the feature is the ability to swap the default ‘widgets’ for third-party ones. That means you can swap the standard calendar view for a third-party one — Calendars 5 supports this at present — or use your preferred task app. The better widgets support actions from the Today view, too, so you can complete tasks from the Today view without entering the app. Clearly developers are still getting to grips with how to use this feature and there’s potential for it to become messy without ruthless curation, but the Today view looks to be evolving in the direction we hoped for when it debuted in iOS 7. Next comes extended support for photo and camera apps. In times of yore (i.e. iOS 7 and earlier), photo editing apps had to import your photo and save it manually afterwards. Camera apps had to do the same if you wanted your photos to appear in the main Photos app. It was slow and cumbersome. PhotoKit, Apple’s photo app API in iOS 8, destroys this barrier. Apps can access your whole photo library easily and save directly to the Photos app. It’s another small but important change that makes using iOS 8 more coherent and consistent than previous versions. Finally, we come to storage provider support. Ostensibly this is focused on iCloud Drive, allowing third-party apps to access and edit the same version of a file rather than being contained within each app. But it’s open to third-party providers, too. We haven’t seen any apps supporting it yet, but Dropbox is open and ready for them to integrate the feature so we should we see how well it works soon. The sooner we see the back of the ‘Open In’ dialog the better. Since we’ve dealt with how iOS 8 interacts with other apps, the next obvious stop is how it interacts with other Apple devices and Macs — what Apple calls Continuity. Sadly you need a Mac running the Yosemite public beta to truly appreciate it, so for now you’ll just have to trust us when we say it’s a revelation. First, there’s Handoff, which makes it easy to ‘pick up where you left off’ on another device. For example, it means you can look up a business in Safari on your Mac and then seamlessly load that page on your iPhone or iPad straight from the lock screen. All you have to do is swipe up from the icon that appears in the bottom left of your lock screen. This works the other way, of course, with icons popping up to the left of the dock in Mac OS. That’s just one example, but there are many more. You can, for example, open an email from your phone in the Mail app on the Mac; take directions from the Maps app on your Mac and open it on your phone; go from editing a document on your iPad straight into the Pages app on your Mac and much more. All this works in either direction across multiple devices and it’ll be open to third-party developers once Yosemite launches. It’s a great feature that really elevates iOS 8 and the Apple ecosystem, but there’s more. The real party trick of Continuity is taking calls from your iPhone on an iPad or your Mac, or the reverse of course. This means you could be sitting at your desk when a call comes in and simply take it on your Mac and not even get your phone out of your pocket. The same goes for the iPad, with both the Mac and iPad defaulting to the speakerphone when there isn’t a headset connected. It’s a fearsomely clever feature and it’s one that requires no real user input. The only requirements are that Bluetooth is active on your devices, that they have Bluetooth 4.0 Low-Energy and that you’re logged into the same iCloud account on each device. No pairing is required, each device just needs to be in range. The same goes for Handoff. This part of Continuity still needs some work, though. The basic concept works fine. Calls route through your iPad when they come in, but the sound quality is muffled and noticeably inferior. You can still hold a conversation, but clearly Apple is butting up against the bandwidth limitations of Bluetooth here. One further Continuity feature that’s yet to be implemented in Yosemite is the ability to send and receive SMS messages, not just iMessages, from your Mac and iPad. Assuming Apple pulls it off reliably, which isn’t assured, it’ll be the finishing touch to an impressive extension of the Apple ecosystem. While the audio quality from Continuity phone calls needs some work, Handoff works superbly and is hugely useful. 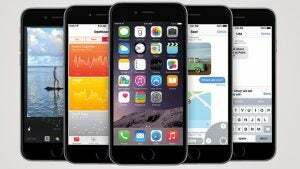 It’s one of the features that elevates iOS 8 from a useful update to an essential one. The post iOS 8 appeared first on Trusted Reviews.